"Create a backup of your web browser configuration"
Nowadays all web browser are customizable, as they allow you to create profiles, set preferences, create bookmarks, and a lot more. However, what if you have to re-install your operating system? After installing your web browser you will have to configure it to your own preferences again, and that can be very tedious. Fortunately, there is an application that can help you out. 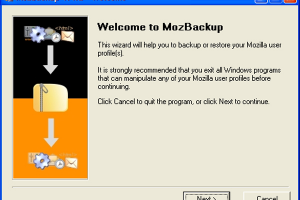 MozBackup is a useful program to backup preferences for Mozilla-supported web browsers and email clients. MozBackup is really easy to use, thanks to its simple and friendly interface. The application is compatible with Firefox, Thunderbird, Sunbird, SeaMonkey, Flock, Spacebird, Suite, Songbird and even Netscape. MozBackup can backup and restore contacts, bookmarks, browsing history, mail, passwords, and much more. You can even use this application in your company to ensure all the computers have the same browsing configuration.